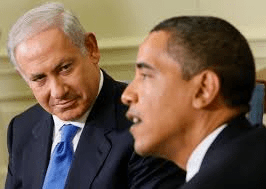 Is Benjamin Netanyahu Becoming Greedy With U.S Relations? Since his ‘miraculous’ win over in his native land in Israel, Benjamin Netanyahu has been over in the U.S an awful lot lately. His most recent ‘political’ move was when he suddenly switched sides on the Palestine issue. So, what does he want with the U.S? I bet I can guess what it is. I bet he want s us to protect his country and people from his neighbors that he’s managed to tick off. He relies on us to help him out while his people come over here and rob us blind. I find this behavior very typical of all the previous leaders in Israel. We don’t need to protect them if they aren’t helping us out in return. I honestly think we should cut them off from ‘funding’. I think that Benjamin Netanyahu has just been misusing our generosity from the day he and his people ever contacted the U.S for ‘help’. I think he should know that it is very unwise to take advantage of our kindness and generosity. And contrary to what the bible says, him and his people are not the chosen people. The ‘chosen’ people are actually from Africa and the Jews stole those writings to cover themselves and get themselves out of the ridiculous amount of trouble they get into with other countries. So, what do think his scheme is this time? Could he have something in store for us down the road? Let us know in the comments.